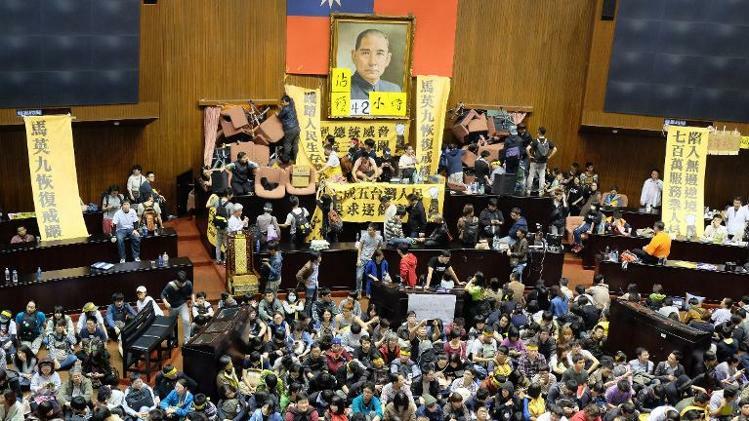 JNN 22 Mar 2014 Taipei — Around 200 Taiwanese students and activists were locked in a tense standoff with police Wednesday after they stormed the parliament in a bid to thwart government efforts to ratify a contentious trade agreement with China. Tearing down signboards and chanting anti-government slogans, protesters unexpectedly broke through security barriers and took over the parliament’s main chamber late Tuesday, in the first such occupation of the building in the island’s history. The protesters, mostly young students, have barricaded the entrance with ceiling-high piles of armchairs, blocking hundreds of policemen who attempted vigorously early Wednesday to push their way in to end the occupation. The protesters are vehemently opposed to what they term illegal moves by the ruling Kuomintang party to pass the trade pact with China, the island’s biggest trading partner, and are demanding that it be reviewed clause-by-clause. “The trade pact must not be approved without careful deliberation and scrutiny in parliament,” a student leader said. The pact — designed to further open up trade between Taiwan and China, which split 65 years ago after a civil war — passed the first hurdle in parliament Monday after it was approved by a joint committee despite opposition concerns that it could hurt small service companies and damage the Taiwanese economy. The committee’s approval — the first of three ratifications needed to pass the bill — sparked a brawl between rival lawmakers and provoked three opposition Democratic Progressive Party legislators to stage a 70-hour hunger strike. The China-sceptic DPP has pledged to mobilise supporters when parliament holds a full session on Friday for a second review of the bill. The pact is one of the follow-up agreements to the sweeping Economic Cooperation Framework Agreement signed in 2010 to reduce trade barriers. Under the deal, China will open 80 service sectors to Taiwanese companies, while Taiwan will allow Chinese investment in 64 sectors. Cross-strait ties have improved markedly since President Ma Ying-jeou of the China-friendly Kuomintang came to power in 2008 pledging to strengthen trade and tourism links. He was re-elected in January 2012. But China still considers Taiwan as part of its territory awaiting reunification — by force if necessary. This entry was posted in Asia Pacific and tagged China, Parliament, Protest, Taiwan, Taiwanese students, Trade Pact. Bookmark the permalink.